The Gospel of John Chapter 14 is the first of four chapters where Jesus teaches his disciples after the Last Supper. Jesus answers the questions of Thomas, Phillip, and Judas. Your learning comes from reading and studying the Bible. After you've read the Scripture passage below, answer the following questions. It's a good idea to do them every day. Answer the questions below from the Gospel of John, Chapter 14. You can download these questions to study the Gospel of John Chapter 14 on your own or with a partner if you like, or we can email the daily questions to you. If you want us to email the daily questions, just complete the form below. You will get 6 emails with the questions for each day. A seventh email will allow you to compare your answers and take you to Chapter 15. 1. Why did Jesus say “Let not your heart be troubled”? What was bothering the disciples? 2. List 3 things Jesus told his disciples so as to calm their troubled hearts. 3. What was Thomas’ fear? 1. 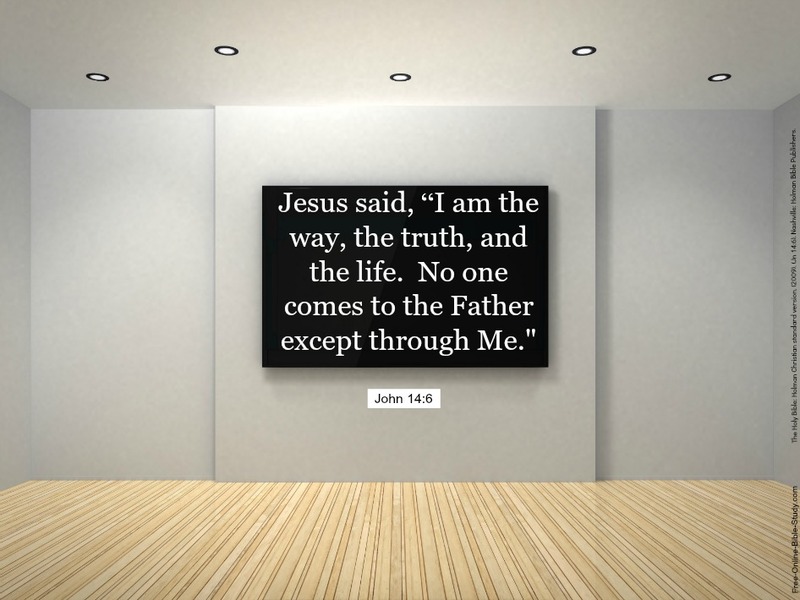 In verse 6 Jesus says "I am the way, the truth, and the life: no man cometh unto the Father, but by me." What does this statement say for the major religions of the world such as Islam, Buddhism, Judaism, Animism, and Hinduism that do not believe that Jesus Christ is the Savior of the world? 2. What are 3 spiritual truths Jesus provides in verses 9 through 11? Where else in the Bible (KJV) do we see this phrase used? 1. What do you think Jesus meant when he stated in verse 12 that “. . .He that believeth on me, the works that I do shall he do also; and greater works than these shall he do. . .”? Specifically, how has this truth been manifested in the world? 2. How many times do you think Jesus stated that he will come back to see the disciples? Cite the verses from the Gospel of John Chapter 14. 3. Three times Jesus states in this chapter of the Gospel of John that “. . .if you love me you will keep my commandments”. What were the commandments of Jesus? 1. What are 2 of the benefits provided in verses 21 through 23 for loving Jesus and keeping his commandments? 2. In this chapter of the Gospel of John there are several truths provided by Jesus that use the framework of a conditional statement. For example, “If you love me you will obey what I command” in verse 15. There are at least five others, list two. 3. What did Jesus imply or state in his answer to the question Judas asked him “. . .why do you intend to show yourself to us and not to the world?" 1. What were the 2 things the Holy Spirit was promised to do for the disciples? 2. Why were these 2 promises associated with the Holy Spirit so important? 3. The disciples must have really enjoyed their fellowship with Jesus and were obviously very troubled at his talk of leaving them. Yet, he comforts them with many truths and promises that should have comforted them. Summarize the picture of their future that Jesus prophesied for them – what was going to happen after Jesus left them? 1. Who is the prince of this world mentioned in the Gospel of John Chapter 14, verse 30 and why do you think Jesus said “He has no hold on me, but the world must learn that I love the Father and that I do exactly what my Father has commanded me.”? 2. How is our situation today like that of the disciples in the upper room? What comfort can we also take from Jesus’ exhortation to them?